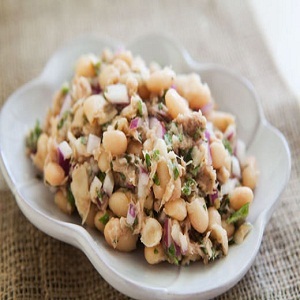 Made from two easily available ingedients, Tuna and White beans, this sald is rich on the nutitious content and is highly liked by people of all ages. The salad can work as an entire meal on its own beacause it is satisfying and fullfilling. The Tuna and Beans combined bring a variety to the table that is simply irrestible and you will find yourself digging into it without any second thoughts. You can always experiment with the dish, adding seasonal vegetables to the tuna and beans. Follow our step by step guide for a simple but incredibly delicious dish. Chop up the onions and sprinkle some lemon juice over it to make them more tangy and juicy. Open the Tuna cans. In a large salad bowl, add the tuna and use forks to cut it into small pieces if you wish so. Add the beans to the tuna, followed by the onions. Mix well all three of the ingredients. In a separate bowl, mix the lemon juice, salt and pepper, virgin oil, garlic and stir well. Pour this mixture unto the tuna and beans. Toss well to get an even taste. Serve in small salad bowls or a salad platter. You can also add other vegetables like tomatoes, Basil and Parseley. Vinegar will also do in place of Lemon juice. The best part about this salad is that the main ingredients can be found canned. You can also store it in refrigerator for upto two days. Cover it properly when storing because the onion smell will diffuse all around it.